If you’re looking for some practice questions about Acid-Base balance, then you’ve come to the right place. That’s because, in this study guide below, we’ve listed out several of them that can help you learn everything you need to know about Acid-Base Balance in Respiratory Therapy school. As an RT student, there will be several important topics that you must learn, know, and understand, and this is one of them. So to make your life easier, we listed all the most critical information for you here. By the way — this study guide correlates well with Egan’s Chapter 14 on Acid-Base Balance, so you can use it to prepare for your exams. Are you ready to get started? If your Respiratory Therapy program is like mine, then you probably use the Egan’s Workbook as well. Don’t get me wrong, it’s a solid workbook that can be helpful at times. The problem is, it takes way too long to look up all the answers, so it tends to be more busy-work than anything else. 1. What does Acid-base balance mean? It is the homeostasis of the hydrogen ion concentration in the fluids throughout the body. 2. 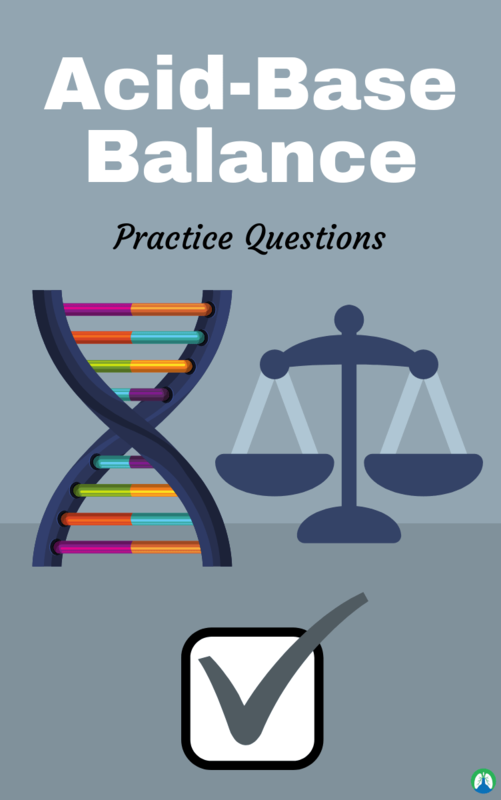 As a Respiratory Therapist, how do we check the acid-base balance of a patient? Collect and assess an arterial blood gas (ABG). 3. What is the hydrogen ion concentration determined by? 4. What are some important sources of acids in the body? HCl (stomach acid), cellular metabolism, CO2 in plasma- generates H+, skeletal muscle (lactic acid- anaerobic respiration), and fat breakdown (glycogen is broken down into glucose and produces acidic ketones). 5. What is one important base in the body and where is the majority found? Bicarbonate (HCO3) which has a huge supply found in the intestine. it is produced by the pancreas to neutralize stomach acid. 6. Why is venous blood more acidic than arterial blood? As the veins carry blood back towards the heart, it contains more acidic gas CO2. 7. Why does pH matter and what is the main element does it affect the most? The proteins in our body (enzymes and hemoglobin included) are very sensitive to pH changes. A very small change can leave them non-functional. Our body needs to maintain homeostasis. 8. What are the 3 chemical buffer systems in the body? Protein, Phosphate, and Carbonic Acid/Bicarbonate buffer system. 9. What are the 3 primary ways to control pH? Chemical buffers, respiration, and kidneys (when respiration isn’t enough). 10. Where is the most water be found in our body? Intracellular Fluid Compartment (ICF) which is inside the trillions of cells in our body. About 2/3 of all body water is found in the ICF. 11. Why does an increase in breathing rate and depth increases pH? It is because more CO2 is expelled from the body. This is referred to as hypocapnia wherein the level of CO2 in the body is low and it will avoid acidosis. 12. Why does a decrease in breathing rate and depth decrease pH? It is because more CO2 is retained. This is called hypercapnia which means there is too much CO2 in the body and can cause acidosis. 13. Where are receptors located which can detect rising CO2 levels and/or rising H+ concentrations? 14. How can the renal response to pH changes help? If too acidic, the distal convoluted tubule in the nephron can secrete H+ and reabsorb bicarb while if too basic, it can secrete bicarb into the urine. 15. What happens during respiratory acidosis? There is an increase in CO2 and an increase in H+. 16. What are some respiratory acidosis conditions? Emphysema, lung cancer, asthma, pneumonia, and hypoventilation. 17. What happens during respiratory alkalosis? There is a decrease in CO2 due to hyperventilation. A decrease in H+ can be treated by bag breathing to re-breath CO2. 18. What are the metabolic acidosis symptoms? Severe diarrhea wherein acid is in intestinal gastric juice and so you lose too much bicarbonate through stool. Another is the kidneys fail to get rid of acid. 19. What are metabolic alkalosis symptoms and what drugs causes this? Chronic vomiting causes this because of losing HCl makes blood basic. Symptoms of metabolic alkalosis are constipation which is reabsorbing excessive bicarb. Diuretics which increases urine and antacids (Alka Seltzer) are the drugs that causes this. 20. What are the normal Acid-Base values? pH: 7.35-7.45, PaCO2: 35-45 mm Hg, HCO3: 22 – 26 m Eq/L, and Glucose: 80-120mg/dl. 21. How would you interpret these values: pH below 7.35, PaCO2 above 45 mm Hg, Normal HCO3? 22. What is a serious life-threatening condition of diabetes that occurs when your body produces high levels of blood acids called ketones? It is a fluid absorbed through the colon for patients who cannot take fluids by mouth. 24. What are the 3 of the most common parenteral routes? Intravenous (I.V.) route is the most common, Subcutaneous (sub-Q) route, and Intramuscular (I.M.) route. 25. How can excessive blood loss be countered and still maintain normal osmolarity? Saline (isotonic, 0.9% NaCl) and requires a very large volume because much of the saline escapes blood and enters interstitial fluid compartment. It can induce hypernatremia (plasma Na+ concentration too high) or hyperchloremia. It is too many H+ ions and state caused by acidosis of the body. It is lack of adequate H+ ions and is a state cause by alkalosis of the body. 28. What are the issues with pH in the body? Cells function in a range of H+ ions and thus if the range leaves the ideal value, cells will not be able to function, and proteins may denature. 29. What is the normal range of pH for our body? 7.45 (low) – 7.34 (higher end). 30. What are the common buffers the body uses as a first-line of defense in response to an increase in pH? HCO3- in extracellular volume, proteins, hemoglobin, and phosphates in cells, phosphates, ammonia in urine. Ventilation via Co2 and renal urine excretion via H+. It minimizes the changes in pH when acid or base is added to a solution. Hemoglobin and proteins are found intracellularly. Extracellularly we have bicarbonate, phosphate, and ammonia. 33. What is the largest single component of the body that is essential for all body tissues? 34. What organs are included in the homeostasis of water? GI tract, kidneys, and brain. 35. Where is most water in the body stored? It is in the intracellular (in the cells). 36. What is the normal blood pH? 37. What is osmotic pressure vs oncotic pressure? Osmotic pressure is the pressure at the cell membrane while oncotic pressure is the pressure at the capillary membrane. 38. What is intercellular also known as? Interstitial space (example of extracellular fluid). 39. What are the signs of dehydration? Headache, fatigue, decreased appetite (olfactory nerve and tongue are too dry), lightheadedness, poor skin elasticity, concentrated urine, decreased urine output, and sunken eyes (ocular muscles are shrunken). 40. What are the major electrolytes? Sodium, potassium, calcium, magnesium, chloride, bicarbonate, and phosphate. 41. What are the extracellular electrolytes? 42. What are the intracellular electrolytes? 43. What are your cations (more acidic, positive charged electrolytes)? 44. What are your anions (more basic and negative charged electrolytes)? Chloride, CO2 (bicarb), phosphorus, sulfate, lactate, and protein. 45. What electrolyte regulates cell electroconductivity and is good for blood clotting (with vitamin K)? 46. Where is calcium stored? 99% in bone and .5% in free form for teeth, muscles, and bone and the other .5% is bound to albumin. 47. How much calcium from the diet is absorbed? 48. How much calcium is excreted by the kidneys? 49. What is the body’s base? 50. What is the major cation of extracellular fluid? 51. What is the job of sodium and chloride? It regulates ECF and plasma volume, nerve impulses, and muscle contraction. 52. What hormone balances sodium? Aldosterone from the adrenal cortex which is stimulated by ACTH that comes from anterior pituitary. 53. What is the body’s acid? 54. What is the major cation of intracellular fluid? 55. What does potassium help you stay protected from? 56. What is the job of potassium? Water balance osmotic equilibrium, acid-base balance, neuromuscular activity, and cell growth. 57. What electrolyte is a major buffer? 58. What is the role of phosphorus? Energy metabolism of ATP (in phosphorylation reactions). 59. How to determine acid-base balance? 60. What are your intracellular buffers? 61. What are your extracellular buffers? 62. What metabolic changes would you check to see for acid-base balance? 63. What respiratory changes would you look for to see for acid-base balance? Changes in dissolved PCO2 level. 64. What is having high levels of carbonic acid from having too much CO2 considered? 65. What could cause respiratory acidosis and what conditions/diseases can cause it? It is caused by an increased CO2. The conditions are decreased lung surface area, such as emphysema (damaged air sacs making it hard to breath), obstructive lung disease (asthma), and neuromuscular disease in which respiratory function is impaired (MS, ALS). 66. What leads to a decrease in carbonic acid from excessive expiration of CO2 and water? 67. What happens with respiratory alkalosis and what causes it? It causes losing too much CO2 and water from excessive breathing which decreases carbonic acid. The conditions: Early sepsis (blood poisoning), anxiety reactions, can be caused from intense exercise. 68. How do you become more acidic? When there is an increase in hydrogen ions. 69. What does it mean when there’s an increase in hydrogen ions (decreased pH) from increased production, increased ingestion, or increased retention or decreased bicarbonate from extracellular fluid? 70. How do you get metabolic acidosis and what conditions are associated with it? Cause: Decreased pH (increased H+) or decreased bicarb from extracellular fluid. Conditions: Diarrhea (loss water and bicarb), uremia (increased NH4), ketoacidosis from diabetes mellitus (type 1), high fat-low carb diet, and drugs (diuretics). 71. How do you get metabolic alkalosis and what conditions, or diseases are associated? Decrease in H+ (increase pH), or increased bicarbonate from retention of base in ECF cause: Diuretics (thiazide), increased ingestion of alkali (fruit), loss of chloride, and vomiting (loss of stomach acid). 72. What is the normal blood pH? 73. What is the normal PCO2 level? 74. What is the normal PO2? 75. What is the normal HCO3-? 76. What is the normal oxygen saturation? 77. What does it mean when there’s an increased PCO2? 78. What does it mean when there is a decreased HCO3-? 79. What does it mean if there is a decrease in PCO2? 80. What does it mean if there’s an increase in HCO3-? 81. How does the body compensate for respiratory acidosis? It increases renal excretion of acids resulting in increasing serum bicarb. 82. How does the body compensate for respiratory alkalosis? It decreases renal excretion of acid resulting in decreased serum bicarb. 83. how does the body compensate for metabolic acidosis? Hyperventilation with resulting low PCO2. 84. How does the body compensate for metabolic alkalosis? Hypoventilation with resulting increase in PCO2. 85. Hyperkalemia or hyponatremia could lead to? Metabolic acidosis (K is an acid). 86. What will be the effect of hypokalemia or hypernatremia? Metabolic alkalosis (sodium is a base). 87. What is the medical treatment aimed at with Respiratory Acidosis? Improving ventilation and Correcting the primary condition responsible for the imbalance. 88. What is the state called in which arterial blood is more acidic than normal? 89. What is the difference called between the normal buffer base and the actual buffer base in a whole blood sample? Decreased hydrogen ion concentration in the blood; blood pH greater than 7.45. 91. How is BE expressed? 92. What is the normal BE? 93. What is the buffer base? The total blood buffer capable of binding hydrogen ions. 94. What is the normal blood buffer base range? 95. What is a titrable, nonvolatile acid called? 96. What does a fixed acid represent? The by-product of protein catabolism. Excess amounts of CO2 in the blood (PaCO2). 98. What is the presence of lower than normal amounts of CO2 in the blood (PaCO2) called? 99. What is the definition of metabolic acidosis? A non-respiratory process resulting in acidemia. 100. What is called when non-respiratory processes, such as losing fixed acid or gaining HCO3-, result in alkalemia? 101. What is the definition of respiratory acidosis? Hypoventilation, the loss of HCO3- or gaining fixed acids resulting in acidemia. 102. What is the definition of respiratory alkalosis? 103. The plasma concentration of HCO3- that exists if PCO2 is normal is known as what? 104. How is standard bicarbonate expressed? 105. What is the PCO2 baseline for standard bicarbonate? 106. What is an acid that can be excreted in its gaseous form called? 107. What is a physiological example of a volatile acid? 108. How much CO2 does normal ventilation eliminate every day? 24,000 mmol/L total 13,000 mmol/L of volatile. 109. What continuously generates H+? 110. What property of H+ is the reason for the need to regulate its concentration? It reacts readily with the protein molecules of vital cellular catalytic enzymes. 111. Why can H+ be dangerous? 112. What gas is carbonic acid (H2CO3) in equilibrium with? 113. What would be the results of an ABG if the patient is hyperventilating? The pH would be greater than 7.45, the PaCO2 would be less than 35, and the HCO3 would be 22-26. The interpretation would be respiratory alkalosis. 114. What are the two major mechanisms responsible for maintaining a stable pH despite CO2 production? 115. What disease can increase fixed acid production? 116. How does the respiratory system compensate for increased fixed and volatile acid production? 117. How do the kidneys compensate for respiratory acidosis? By reabsorbing HCO3 back into the blood. 118. What can be done to correct respiratory acidosis and improve alveolar ventilation? Bronchial hygiene, lung expansion, non-invasive positive pressure ventilation, intubation, and mechanical ventilation. 119. What are some signs of respiratory alkalosis? Paresthesia, dizziness, headache, and hyperventilation. 120. How do the kidneys compensate for respiratory alkalosis? By excreting HCO3 in the urine. 121. What is a buffer solution? A mixture of acids and bases that resist changes in pH when an acid or a base gets added to it. 122. How are blood buffers classified? They are classified as either bicarbonate (open) or non-bicarbonate (closed) buffer systems. 123. What can be done to correct respiratory alkalosis? 124. What acids does a closed buffer system buffer? 125. What acids does an open buffer system buffer? Fixed, only when ventilation is not impaired, plus any individual H+ regardless of origin. 126. What are the two ways that metabolic acidosis can occur? Acid accumulation in the blood or excessive loss of HCO3. 127. What is the normal anion gap range? 128. What does the buffering of a fixed acid produce? 129. What is the most important non-bicarbonate buffer system? Hemoglobin because it is the most abundant. 130. What is the common blood fluid compartment that both open and closed buffer systems function? 131. What are the primary acid excreting organs? 132. Which is faster at removing acid, the lungs or the kidneys? 133. Why is CO2 elimination crucial? It reacts with H2O to form large quantities of H2CO3. 134. What is the anion gap? It is the calculation of 4 electrolytes (Na+, Cl-, K+, and HCO3-). 135. What is the purpose of using the anion gap? To eliminate the effects of respiratory involvement; i.e. to see what’s going on at the metabolic level. 136. What is indicated by an anion gap greater than 16? 137. What are some of the symptoms of metabolic acidosis? Dyspnea, hyperpnea, Kussmaul’s breathing, lethargy, and coma. 138. At what pH are severe cardiac arrhythmias likely? 139. How do the lungs compensate for metabolic acidosis? 140. What factor determines how much H+ is removed by the kidneys? 141. How much fixed acid is excreted per day by the kidneys? 142. In what 2 ways can metabolic alkalosis occur? Loss of fixed acids or gain of blood buffer base; either one increases plasma HCO3. 143. What is the most complicated acid-base imbalance to treat? Metabolic alkalosis; it involves fluid and electrolyte imbalances. 144. What is the goal of secreting less H+? To increase the amount of HCO3- in the urine; increase the amount of H+ in the blood. 145. What is the goal of secreting more H+? To increase the amount of HCO3- in the blood; decrease the amount of H+ in the blood. 146. What are some of the causes of metabolic alkalosis? 147. How do the lungs compensate for metabolic alkalosis? 148. What maintains bicarbonate levels? 149. What maintains CO2 levels? 150. pH changes caused by PaCO2 are referred to as what? So there you have it! That wraps up our study guide about Acid-Base Balance. I truly hope that these practice questions were helpful for you. If you still don’t get it, that’s okay! Just make sure you go through this information again and again until it sticks. Thank you so much for reading and as always, breathe easy my friend.